Phonetics For Pronouncing 'Arc De Triomphe'? 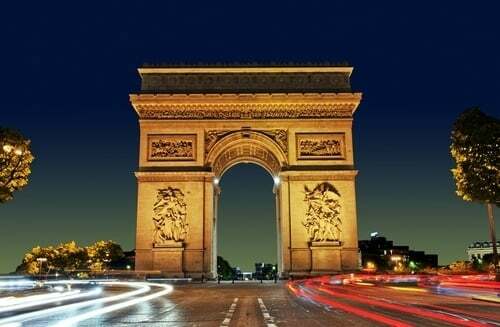 Arc de Triomphe is one of the most recognizable monuments in Paris after the Tour d'Eiffel. It stands at the western end of the Champs Elysées in the center of the Place Charles de Gaulle (previously the Place de l'Étoile). It was commissioned by Napoleon, no less, in 1806, but it wasn't completed until 1836. The original architect was Jean Chalgrin, who died long before it was completed. He used a Neoclassical Style of ancient Roman architecture to design the monument which stands 50m (164 feet) high. The Arc de Triomphe is decorated with scenes from French military victories, and names of great French Generals are inscribed on it. The Tomb of the Unknown Soldier lies beneath the Arc to commemorate all those who died unidentified in war.